During the days when California was under the control of Mexico, Isaac Graham built a sawmill on Rancho Zayante near a bend along Zayante Creek where Bean and Ferndale Creeks cascade down in a beautiful waterfall. By the time the South Pacific Coast Railroad passed through the area in 1880, this bend hosted a small rural farm but was nothing of note. No railroad stop was established here and passengers saw nothing to catch their fancy. Indeed, the railroad bridge to the south that crossed Zayante Creek over a relatively deep chasm was undoubtedly more exciting. Eventually, the 200-acre property passed to Frederick A. Hihn, who sold it to Thomas L. Bell in 1897. It was under Bell's leadership that this site evolved from a small farm into a destination resort. Under Bell's leadership, Arcadia emerged with the deluxe Tuxedo Inn Hotel, built in 1901, as its centerpiece. Around the hotel grounds were cottages, a small store, restaurant, and ballroom. 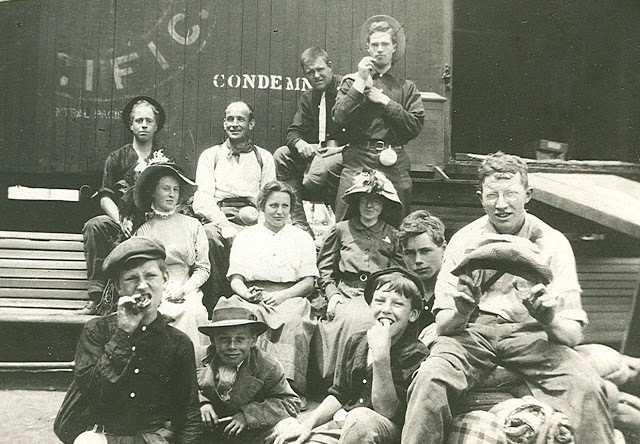 Alongside the tracks, which ran on the west side of the property, Southern Pacific Railroad erected a small shelter station under the name "Campus," which began operating in 1898. Bell wanted to name the station Arcadia, naturally, but the railroad refused due to that name already being in use elsewhere in the division. Thus, Bell adopted the name "Tuxedo," which quickly became associated with the entire resort. Tuxedo was named after Edward Henry Herriman estate in New York called Tuxedo Park. The word "Tuxedo" itself is probably based on the name of an Algonquin Indian group, and its later use to describe fancy clothing was also based on the lavish parties held at the Herriman estate. And just like the East Coast Tuxedo, Bell wanted his resort to shine. He installed 200 lights throughout the property, many of which went toward lighting a large ballroom and dining area beside the hotel. He also dammed the creek to create an artificial lake for boating and fishing. Anticipating future expansion, Bell purchased 200 acres across Zayante Creek, which were integrated into Tuxedo in 1904. Bell was always looking for the next project and by 1905, he appears to have grown tired of Tuxedo and began planning a subdivision on the south side of Felton. 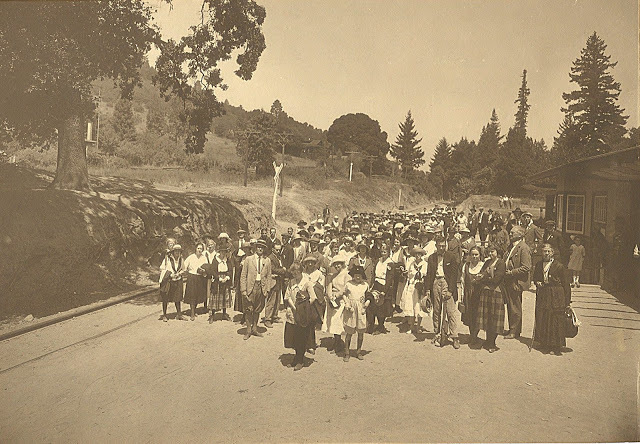 On December 12, 1905, a group of evangelical Christians held a summit in nearby Glenwood and initiated plans to purchase a property in the Santa Cruz Mountains for use as a seasonal retreat. Tuxedo was a perfect fit and Bell was all too eager to sell. 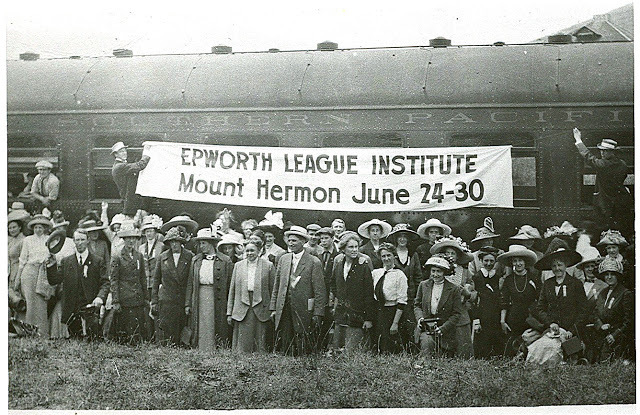 On April 14, 1906, the Mount Hermon Association purchased the property and began its conversion into an entirely new kind of mountain resort. 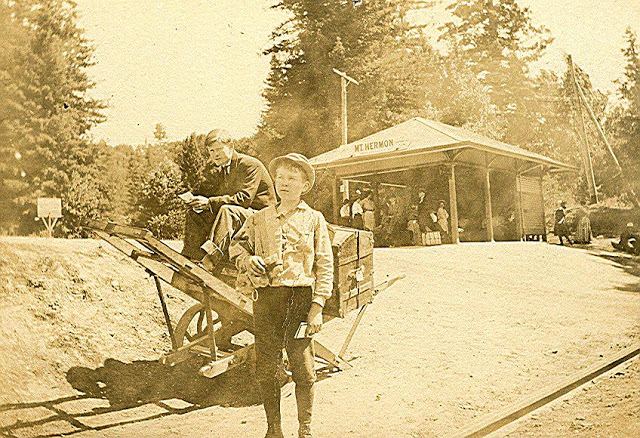 Almost immediately, the site and railroad station were renamed Mount Hermon and the hotel given the name Zayante Inn. The hotel's reputation as a popular gambling and drinking parlor was of no interest to its new owners. The first year proved wildly successful as guest speakers came from around the West Coast to speak at conferences and retreats at the resort. In May 1907, a post office was added, further increasing the site's visibility. The railroad recognised the location's popularity by upgrading the shelter there to a full depot, which was installed in 1914. 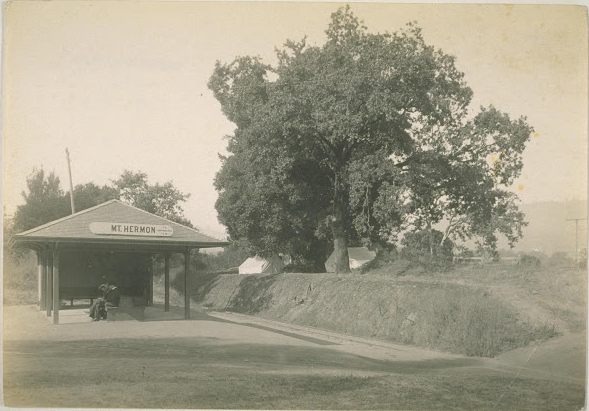 This depot not only featured a passenger office and baggage storage room, but also included long covered patios on either side for people awaiting the next train. 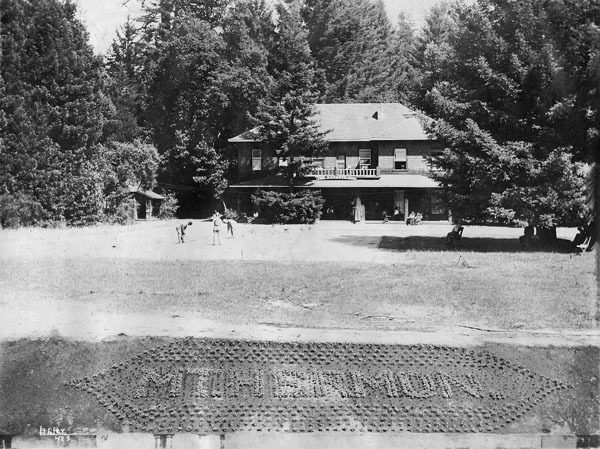 Zayante Inn remained the center of Mount Hermon until a fire destroyed it and the surrounding area in 1921, at which point the organization relocated across Zayante Creek. The area around the station was largely abandoned except as a picnic and camping area for a number of decades, while the post office was eventually relocated with the rest of the resort across the creek. A new conference center was built there and summer cabins began spreading into the hills above it, permanently shifting the center of the Christian retreat. By this point, tourism via rail was on the decline. 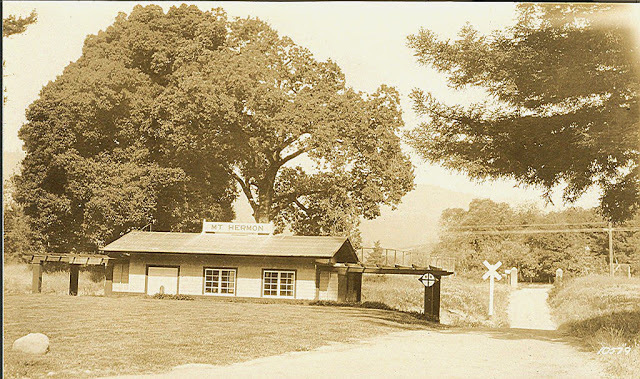 Nonetheless, Mount Hermon's station remained on railroad timetables until 1943, when the railroad petitioned for its abandonment. At this time, it was the northernmost station along the southern portion of the former route through the Santa Cruz Mountains. Passenger rail no longer operated within the county except for seasonal specials, so there was no compelling reason to keep this remote station operating. 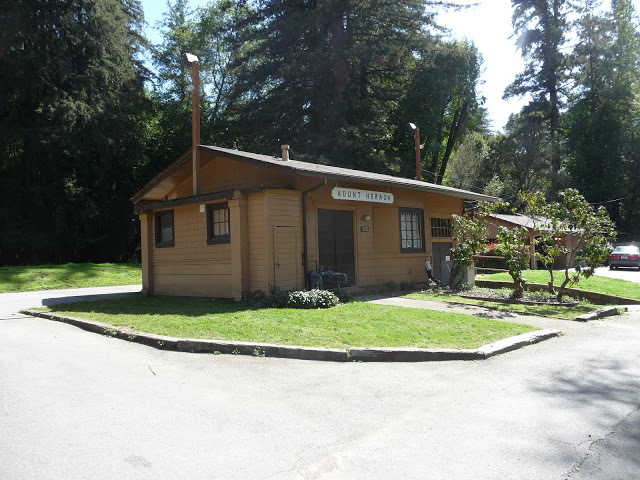 The railroad sold the depot to Mount Hermon, which converted it for use as the private cabin of the head male councillor of Redwood Camp. It remains one of only two confirmed narrow-gauge depots still existing in Santa Cruz County, the other being Felton's depot. The surrounding grounds, once Arcadia and then Tuxedo resorts, are now used by Mount Hermon for summer camps, as well as other retreats and functions throughout the year. Every summer, the adjacent railroad tracks are still used by the Santa Cruz Big Trees & Pacific Railway to shuttle camp groups to the Santa Cruz Beach Boardwalk. Mount Hermon depot is currently owned by the Mount Hermon Association and trespassing is not permitted. 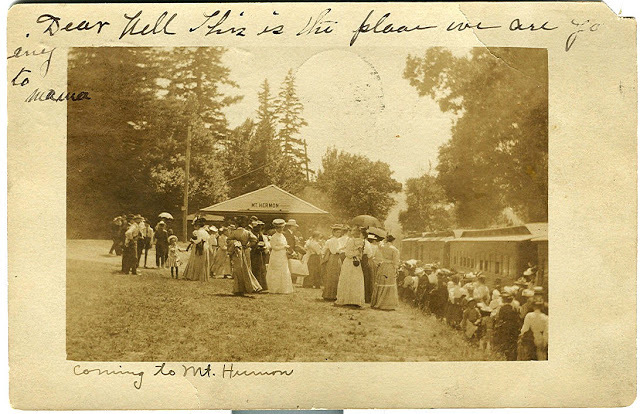 Similarly, the tracks through this area are owned by Roaring Camp Railroads and trespass laws are enforced by both Roaring Camp and Mount Hermon in this area, due to the presence of children in the summer. Although the depot structure has undergone numerous additions over the decades, including the enclosure and truncation of both patios into rooms, the basic structure and its location beside the tracks remains unchanged. Other features of the original Arcadia resort are mostly gone, although remnants of the original dam and a few foundation stones at the site of the hotel can still be found. Dawson, Dan. Personal correspondence, November, 2012. Whaley, Derek. R. Santa Cruz Trains: Railroads of the Santa Cruz Mountains. Santa Cruz, CA, 2015.